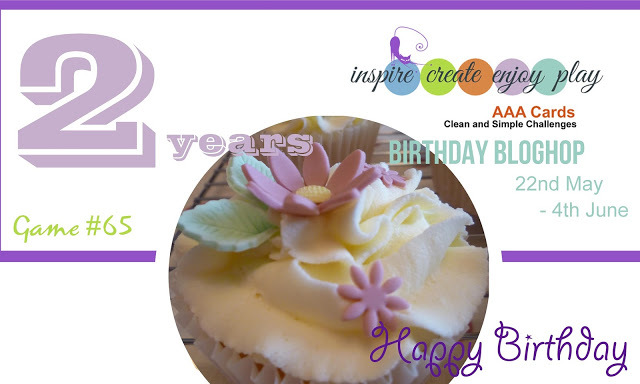 This week over on the Simon Says Stamp Monday Challenge the theme is "Make a Wish" while at AAA Cards there is also a birthday theme in honor of their 2nd birthday. 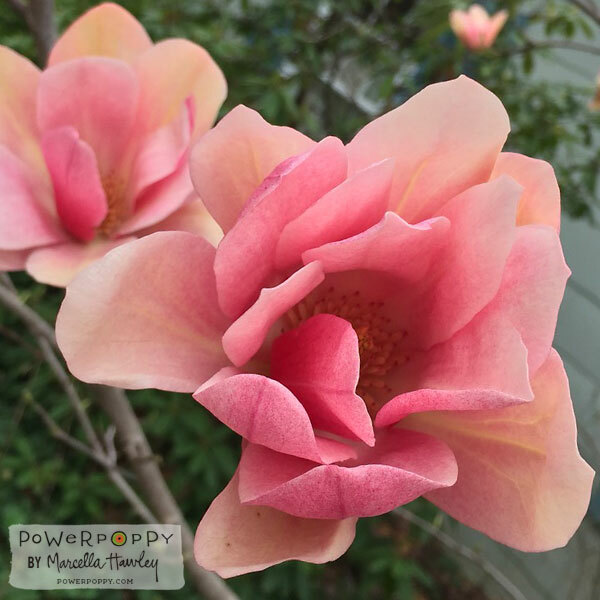 I recently discovered a small, pretty new company, Power Poppy, that has incredibly detailed floral images including a Magnolia which to me is the most beautiful and regal of all the flowering trees although Crabapple and Cherry Blossom Trees would be a close 2nd. I talked quite a bit about this company a few days ago on this post. I wanted to create the Magnolia Coral Lake color in the card for today. There is even a Black Tulip Magnolia which has deep purple blooms. I didn't even know these existed a week ago. I started with a 4.25 x 5.5 inch piece of watercolor paper. I stamped the Planning For Magnolias branch using Versamark Ink and heat embossed it using Simon Says Stamp Antique Gold Embossing Powder. I stamped a second time coming in from the opposite corner using just a portion of the stamp. I always use a powder "tool" of some kind these days which in this case was a small container of baby powder and an Oval Mop dry paint brush. I have an EK Success Powder Tool but I don't like it as well and the bristles break off way too easily. I keep one method on my desk and one on my table so I'm covered either way. For heat embossing I normally work on my table because it is right next to where my heat tool is plugged in. I walk over there and turn on my heat tool to start warming up while I do the actual stamping and sprinkling of embossing powder. It works perfect to get my heat tool warmed up. For my flower colors, I used Abandoned Coral Distress Marker with a Zig Clean Color Real Brush Pen in Sugared Almond Pink. I started with a light wash of the coral and then added pink and coral in layers until it suited me. I'm not sure my photograph can accurately capture the color, but trust me when I tell you it is there. I used Gathered Twigs and Forest Moss for the branch and leaves and I was able to finish this in about 30 minutes. I'm not really a cutesy critter or punny sayings kind of girl, so florals are always a fantastic choice for nearly any kind of card I want to make. My favorite sentiment stamp set, "Graceful Greetings" from Papertrey Ink, was used for the "Happy Birthday". Once all the painting was completed and dry, I gave the whole panel a spritz of Tsukineko Sparkle Sheer Shimmer Spritz and set it aside to dry while I made a card base from Stamper's Select White and cut a background panel from Berry Sorbet, also a Papertrey Ink Cardstock. I really love all of their cardstock. It is 110 lb. and so smooth. I've beeen scrapbooking or making cards for 18 years by now so I have used a lot of cardstock in my day and I think theirs is absolutely the best quality out there. I also find their prices to be very reasonable. Everything was assembled to the card base using my ATG gun. My mother-in-law has a birthday coming up on June 2nd and I know she will enjoy the beautiful colors in this card so I am planning to send this to her. That's the project for today but thank you so much for stoppng by. I'd love to have you subscribe to my blog via e-mail if you like. I post on average 4 times a week or more. I'll be back with another project soon. Such a very beuatiful card, loving those embossed magnolias. Thanks for joining in AAA Cards birthday celebrations. Truly beautiful card, love the gold embossing and the flower stamp you have used. Also the colouring is just stunning. I love gold embossing with water color. You've done a beautiful job. Thanks for joining in the birthday festivities at AAA Cards!